The story of Wiggly Bridge distillery started as a joke at a family dinner table. What happened next was no joke, though, but more than anything a story of great success. The father and son team of David Woods and another David Woods gradually took up the craft of small batch distilling. They researched, studied and obsessed over how to build a still and process alcohol. The spirits are distilled from their sour mash recipes using a handmade copper pot still. Wiggly Bridge distillery is winning awards all over the place, so their commitment to family, hard work and constant growth is definitely paying off. What's the reason for the funny name? Well, the Wiggly Bridge is the smallest pedestrian suspension bridge in the US. It also wiggles as you walk over it, obviously. The distillery produces six different spirits, among which is also Wiggly Bridge Small Barrel Bourbon. The latter has been aged for 22-26 months in smaller than traditional barrels and is bottled at 45% ABV. Because they use smaller barrels, the Whiskey can age quicker. This is a great cocktail spirit, but has the necessary character to proudly stand on its own. If you’re a Bourbon fan, you’ll surely appreciate this combo of quality, integrity and authenticity. It’s a small business with a big Spirit. 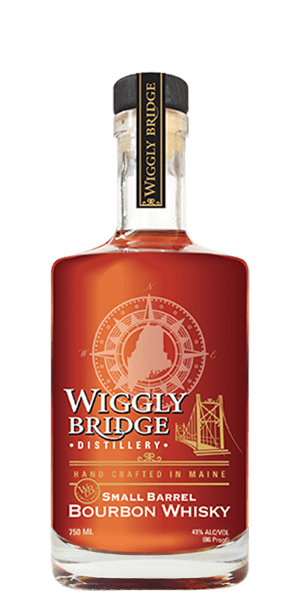 What does Wiggly Bridge Small Barrel Bourbon taste like? The Flavour Spiral™ shows the most common flavours that you'll taste in Wiggly Bridge Small Barrel Bourbon and gives you a chance to have a taste of it before actually tasting it. Bourbon must be made from a grain mixture that is at least 51% corn. Really opened up with a little bit of water. I enjoyed trying this for the first time. Got it as a gift from a friend in New Hampshire. I am not an expert, but I love the taste on the rocks, I can't imagine mixing it with anything, I use lesser whiskeys for cocktails. I Like Beer Barrels on That I Cannot Lie, but Only for Aging Scotch, Bourbon or Rye! Different Grapes, Different Wine. Different Corn, Different Bourbon?